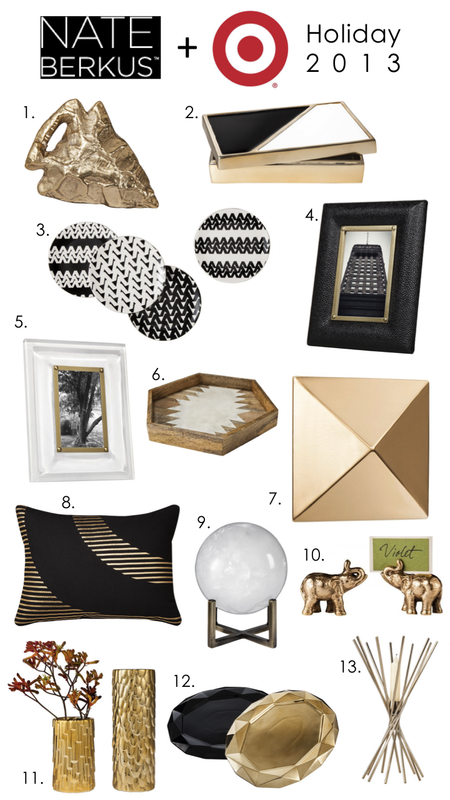 Ever since I saw some of the pieces from Nate Berkus's Holiday collection for Target in the return issue of Domino I have been stalking their website and stores to see more. I could just tell it was going to be good. Check out those wall studs and how they used the platter on her dressing table. Today I FINALLY saw the pieces in store and let me tell you they do not disappoint and just in time for Thanksgiving entertaining too. If you have the same obsession with a black, white, and gold color scheme that I do then you will love this! 5 // White Clear Resin Frame ($12.99)..this one came home with me! 7 // Gold Wall Stud ($14.99-$29.99 each)...I was a little disappointed these are not as gold as they appear in person. 8 // Metallic Eyelash Pillow ($19.99) I would buy so many more pillow from Target if they had zippers so that you could use better inserts...but for a Budget buy this is a great look. 10 // Set of 2 Elephant Place Card Holders ($9.99)...obsessed with these! 12 // Ceramic Faceted Platters ($29.99 each)...These are even better in person...super heavy! This collection is going to get me in a LOT of trouble! !